MONA CARON:The downtown part of the mural is an exaggerated representation of reality. You can see a horrible traffic jam happening here. It's six o'clock and Critical Mass is starting, and there's something strange that's happening. Some of the bicyclists are taking off, on strange contraptions and flying machines. They're all lifting up and flying around in the air. Each one is trailing a yellow banner. These people represent the dreamers of the city, the utopians, the people who have an idea of what reality could be like. That's what the yellow banner symbolizes. 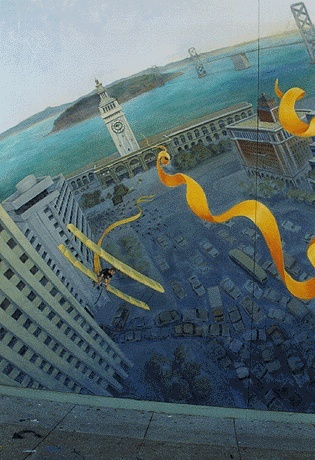 You can see one huge yellow banner that turns into… the rest of the mural, meaning this is one of the possible ideas of how the city could be. We take a close-up of one of these banners--one of these utopias--and we discover a representation of a very realistic and plausible utopia. The banner is flapping. Things on the banner become alive and start moving. The public mural movement has decorated public places in many corners of town. But the Wiggle Mural, or as it is officially entitled: The Duboce Bikeway Mural: Gateway to the Wiggle, unifies all these trends in surprising and inspiring ways. This mural, incongruously on a 400-foot wall on the back of the nation's largest supermarket chain, decorates a place, celebrates a vision, and takes a position--well, actually it takes several. Public art rarely speaks in such a subtle and charming voice, while still packing a punch for anyone who spends the time to take it all in. The Wiggle Mural is a welcome antidote to the sterile corporate planning and tepid public art increasingly inflicted on us throughout a San Francisco slowly succumbing to creeping monoculture. The Wiggle Mural repudiates the insipid hollowness of San Francisco's boosters, while staking out a vision of a radically improved city. Cleverly it represents and symbolically extends its own physical presence astride the crossroads of bicycling San Francisco. As it flows through the hours and along the journey from east to west (or west to east), it broadens our concerns to all kinds of human mobility (the art of moving), as well as the relation of our mobility to the surrounding ecology. Visually and intellectually it forces us to re-think, altering the boundaries of our thoughts, using dimensions of self-reflection to push us beyond our own assumptions about what is and what could be. A fresh approach is offered here to the art of public murals. The Wiggle Mural is unique in style, scope, and integration of purpose with place. Splendid public artists such as Rigo and Twist and the Precita Eyes muralists have been joined by Mona Caron, Joel Pomerantz, Gordon Dean and their team. The walls of the city blandly and maddeningly snore, or perhaps they yammer the usual buy! and sell! -- except in the oppositional art that leaps at us from surprising places. The Wiggle Mural is situated to entertain and edify a constituency of bicyclists, pedestrians and Muni riders, precisely the subjects it includes and addresses. As Joel Pomerantz put it in the following interview, its our mural, its our space. As of this writing, the bikeway itself is still unimproved. But months ago, long before the mural was finished, the space it was beginning to adorn was already taking on a new life as the public commons of cyclists and other citizens ready to embrace a different approach to city life. In an era when market relations increasingly throw us as isolated shoppers into malls and other zones of hyper-accelerated, transaction-oriented behavior, the re-emergence of new areas of public commons is heartening indeed. The Duboce Bikeway is a beachhead in a long, slow battle to transform San Francisco into a city really worth living in--not just for the affluent, but for everyone. Every inch of territory we can take away from the banal daily descent into life as targeted markets helps restore our humanity a bit. The Wiggle Mural inspires us to take flight, to dream our dreams. 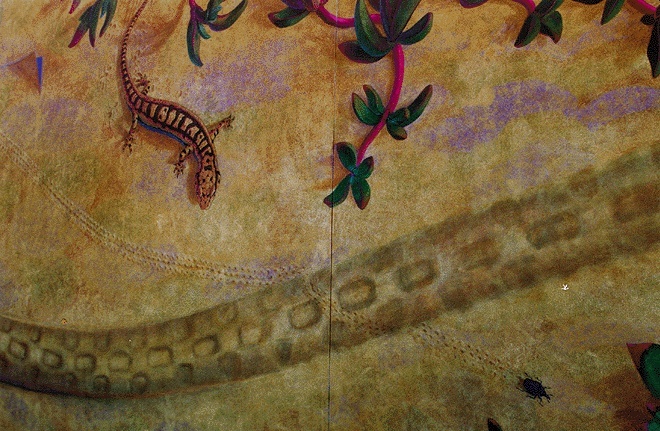 But the making of the Wiggle Mural offers a more concrete example in how different life can be. It succeeds as art, it inspires us politically, and it helps a community find itself in its own place. But as an example of how to pull off a huge complicated project through a cooperative, community effort, embodying our best hopes for human freedom and creativity, the Wiggle Mural is a remarkable achievement of practical revolt. Our friends and neighbors who tasted the trust and mutual aid that was shared in this project have gained immeasurable wisdom, and are a reliable source of confidence and know-how for the challenges to come. They've made their mark and can rest assured, this project has already changed life! MONA CARON: The Victorians are more colorful than they are in reality, because we wanted to represent the diversity of our community, not just in terms of ethnicity, but also in terms of ideology. So each one of these houses is symbolic for a particular ethnicity or ideology, or religion even! The yellow house is Buddhist house, we put a little Buddha in the window and everything, it has Tibetan colors. There's another house that is also slightly golden color which is a North African color scheme. The corner house is red, its the Commie house, with a Cuban flag in the window, and so on. Joel Pomerantz (JP): The first time that I had an overall perspective about the role of the community and the role of the mural in the community was the first day that I stayed until dusk during the summer. We left at different times everyday, and rarely stayed past 5 or 5:30, because the sun would come into view on the wall, and highlight all the bumps. It was also starting to get really windy. One day it wasn't windy at all, so everyone left and I stayed. I just sat on the stoop of our paint wagon and watched as the sun went down behind and reflected off the windows on the hills in the East Bay. I was sitting there contemplating what a beautiful spot it must have been before all the buildings were there, when I started to notice more and more cyclists going by from downtown. Maybe one out of ten would be someone I knew. About half of them would wave or just ring their bell, or somehow acknowledge my presence there, at least partly because they knew I was connected with the mural. More and more of the people I knew started showing up and talking with each other. We were creating a place for people to meet each other and exchange ideas, and use the public space, the street, as a kind of a market place. The ideas were flowing back and forth between that space and the Bike Coalition office through a corridor of bicycles going back and forth doing errands. During that hour and a half period of time all kinds of stuff happened, leaflets were exchanged, newsletters were brought, people were asking other people to come and meet them there. It just happened to happen, on a beautiful day with no wind. Mona Caron (MC): Yeah, it definitely became more and more of a meeting point, especially for bike commuters who were coming from downtown. Sometimes there were as many 15 or 20 people spontaneously stopping and chatting. 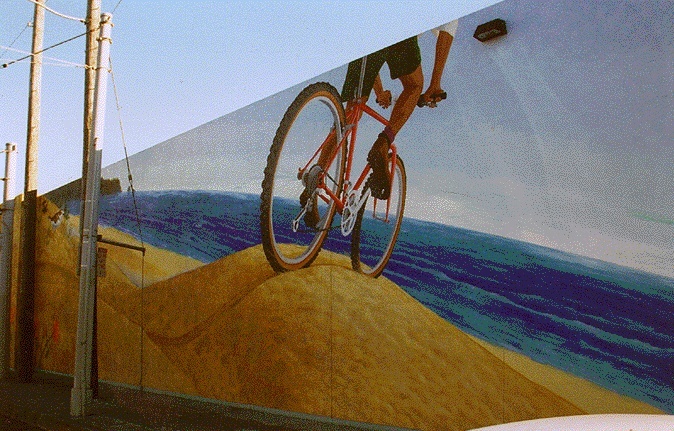 In the mural I wanted to represent how as a bicyclist you get to see the land from a much closer point of view. That's represented symbolically by having this extreme close-up of the creatures. As the muralist, I was basically living at the mural, except at night when I went back home to sleep, (I was in a kind of privileged position), and by that I got to have a literal close-up look at the street. The whole mural project gave me an opportunity to get to really know other communities, or non-communities, like for instance, the homeless people living there, and neighbors, other people that lived around there. As the project progressed, I started getting there earlier and earlier in the morning, and staying later and later in the evenings. Chris Carlsson (CC): Communities are something you forge in the practice of relating on that day-to-day basis. Anybody can connect in that form, it doesn't matter what your background is. Thats why urban street spaces are so interesting to me, because they bring people together who normally would not cross each others paths, but if they do and something stops them--that's where you guys come in, you've created something to stop them. Gordon Dean (GD): That's the difference between my experience painting there and other experiences I've had on the street. Usually I'm trying to get somewhere, and so I'm riding my bike and I'm avoiding traffic, and blah blah blah. Here I was planted in one place for a long period of time. You saw things pass by you. It's just a very different view. CC: You talk about other groups of people, other individuals, not particularly painters, coming there, finding their reason to stop, and actually forming new kinds of relationships, or maybe taking new initiatives based on having discovered each other there in that space? I would assume that the latter would largely arise among bicyclists? JP: Lots of it was non-bicyclists, especially in the last three weeks. Once there started to be people in the mural, and a lot of detail, the Victorian houses and the buildings downtown, the Ferry Building, those kinds of details attracted people giving their friends and out-of-town visitors walking tours of the wall, even before it was done. It really did spark a new sense of what that part of town is for. People told us that they had changed their commute route to come past there, or they had gotten off the Muni train even though that wasn't their destination, or that they had purposely walked around the back of the Safeway instead of the front while they were going home with their groceries. It's not just the mural, it's partly because Safeway had increased the street lighting with six new bright lights, and blocking off the cars made it safer. So the three really combined to create a much more user friendly space. MC: Among bicyclists, the word spread relatively quickly that the mural was going up, the Bike Mural. (It immediately got called the Bike Mural.) So the bicyclists often knew what it was about, but a lot of people, pedestrians, neighbors, were just surprised as they watched something unfold before their eyes that they hadn't known anything about. So it was fun to watch them watch the process without knowing what it was going to be. JP: My favorite moments were when people would come up, and I would chat with them because I usually wasn't painting. And if they said the thing that Mona most wanted them to say, I would run over to Mona, and say 'Another Person! Another Person!' which was another person who said something like don't show me the sketch of what it's going to look like, I just want to see it revealed day after day. MC: Exactly! It was kind of what I'd hoped, actually. One idea I'd had at the beginning was to choreograph the way we were going to paint it so as to make it the most fun to discover. CC: So how do you like having it called "The Bike Mural?" Do you have a preferred title? If you saw it as an independent piece of art, independent of its origins in the Bicycle Coalition, would you give it a different name? MC: I like the fact that it has no name really. The Bike Mural is really a way of referring to it, describing it, because at one end there's this huge bicycle, and it was commissioned by the Bike Coalition. There were big signs saying that, so it is almost natural that people, for short, would call it the bike mural. But to me that's not really the name, but a description. CC: I think of it as The Wiggle Mural. MC: Right, I would kind of agree with that, but I like that it doesn't have a title. JP: I think it should have a title and a subtitle. The title should be what it is: The Duboce Bikeway Mural: Gateway to the Wiggle. MC: The Wiggle Mural comes closest to what it's about. CC: On Safeway, no less. JP: Yup. So I really like the implications of that. Its our mural, its our space. To those people who come by and say its just too bad its back here where nobody sees it, I proudly declare, A whole community of people who don't drive cars go by here every day, more than 50,000 people everyday. Those who drive cars see it from a different perspective. CC: I like your account about the unifying quality of the mural from one end to the other, and how it literally bridges the two sides of the city, its the crossover point. 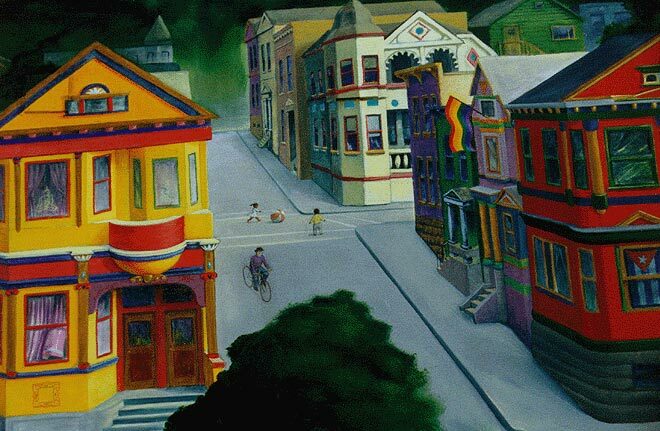 JP: Weve created the mural like a cross-sectional view, just like any full street of San Francisco, like Mission Street that goes all across the city, or 3rd Street, or Geary or one of these streets. CC: People had been using the Wiggle as a transit thoroughfare and identified it as the wiggle at least five years before this mural came up, wouldn't you say? Or longer? JP: Oh! Significantly longer! In the historic photos that I got from Greg Gaar, in 1856, farm fences went in a wiggle shape along a creek, separating the land that way. 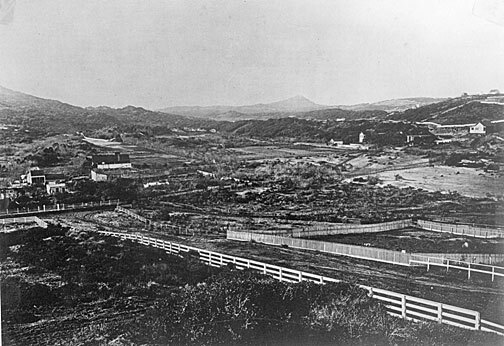 The easiest way to get from Mission Dolores to the Presidio (the earliest European outposts here) was right through there, the flattest way. CC: But in terms of bike commuting, it makes perfect sense that most bike routes are on the old waterways. People use the lowest, flattest way to go. JP: It started being called The Wiggle around 1990 or 1991. I first heard the term in 1993 or 92, I think from Steven Bodzin. The theory is that either Kash or Steven Bodzin coined the name. GD: A couple of people at the unveiling, and thereafter, talked to me about how the mural changed their experience of the Wiggle. It used to be this creepy place and you had to ride your bike against one lane of car traffic coming towards you. I remember doing this at night, you go to the corner, and if you don't see headlights, you proceed. Otherwise, you're worrying how wide is that car, really? Cuz its not a really wide street, so then you think do I have to jump up on the curb? Then you're not really sure who you're going to find in that alley. People say that now they feel they're arriving in their neighborhood, or they've left work and they're coming home when they pass this threshold. Its a fun place to be. That was very gratifying for me to hear from other people, because I was having that feeling myself. Here were suddenly in a sandy area, and are very close to the ground. We started from a bird's eye view of downtown, and we end up with our nose inches from the ground, seeing very small things and other things that are very, very large. I wanted to have at least one part of the mural symbolizing the fact that if you get around under your own steam, if you walk or bike, you're closer to the land. You have the bicycle tracks left and you have the tracks left of many small creatures, little beetles, a seagull, a raccoon and they all leave a funny pattern in the sand. I wanted to show the similarities between the path left by a bike tire and the patterns left by other earth creatures, to symbolize the fact that a bicycle is a relatively low impact vehicle on nature. CC: Why do you suppose that so many of us have decided at this time to give political meaning vis-a-vis community and social interaction to the bicycle and not to the bus, where were all sitting next to each other and could easily have conversations and have new social experiences? MC: If you take a bus you are sitting close to a lot of other people. Its a much deeper experience in terms of connection with your social surroundings. When I ride a bicycle I mostly connect with other bicyclists. But when I take the bus, I think there is a wider cross-section of society that I encounter. Also in a bus, you are in an enclosed space together with people that you wouldn't ordinarily meet in the rest of your daily life. In terms of exposing oneself to the rest of society, I think taking the bus, or public transportation, is superior. I think its good for people every once in a while to be in a situation where they face the reality and presence of the rest of society, the true diversity. MONA CARON: In the end where you see the bicyclist riding off into the sunset. Its an image in which you see the bicycle from below, an angle that automatically tends to glorify whatever is represented. In a way were ironically glorifying the bicycle, and also holding it forth to the viewer as a possible means of [experiencing the utopian possibilities in the rest of the mural.] The perspective is still very close to the ground, the camera has just swiveled from a close direct look about a few inches from the ground to see the bike from the same low angle. This giant fish-eye scene says if you choose this vehicle, you can see more things on the ground, than if you're driving a car.